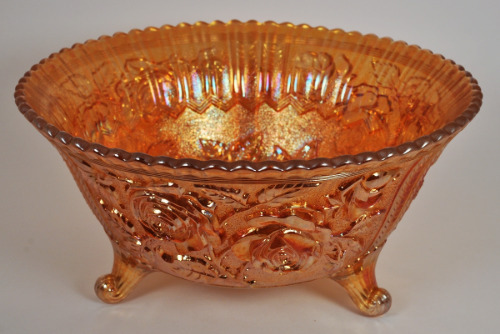 A most excellent condition carnival glass bowl from Imperial Glass referenced as made between 1912-1930. This one is in excellent condition with no chips, crack, hairlines, or flaws. Very nice intricate design of raised roses and lustre glaze. A wonderful showpiece for your Carnival or Imperial Glass collection! Makes a beautiful fruit bowl centerpiece! IMPORTANT SHIPPING NOTE: This will ship very carefully packed and double boxed via USPS Priority Mail for faster and safe delivery to you.